Day two on the Disney Dream was just as full of excitement as the first day. We had to get up early for our breakfast seating time. Everyone is assigned restaurants and times to have breakfast. I was very happy with the gluten free menu accommodations for our son. Sometimes when you travel it is hard to find options but once our server found out about his dietary restrictions they were on it. He was able to enjoy yummy pancakes, donuts and Mickey Waffles just like the other kids. Tip 4: Let the server know if you have any food allergies. 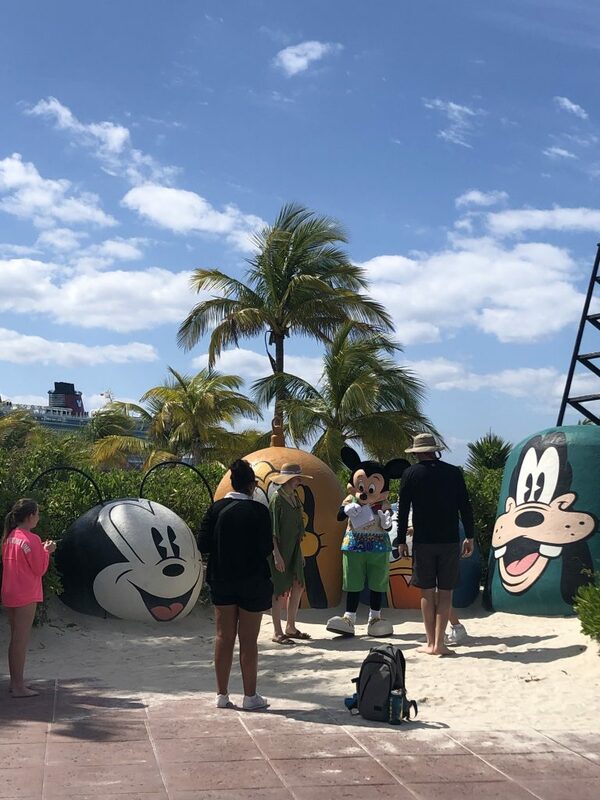 After breakfast at the Royal Palace we gathered our beach bags and departed the ship for a busy day at Atlantis Aquaventure. 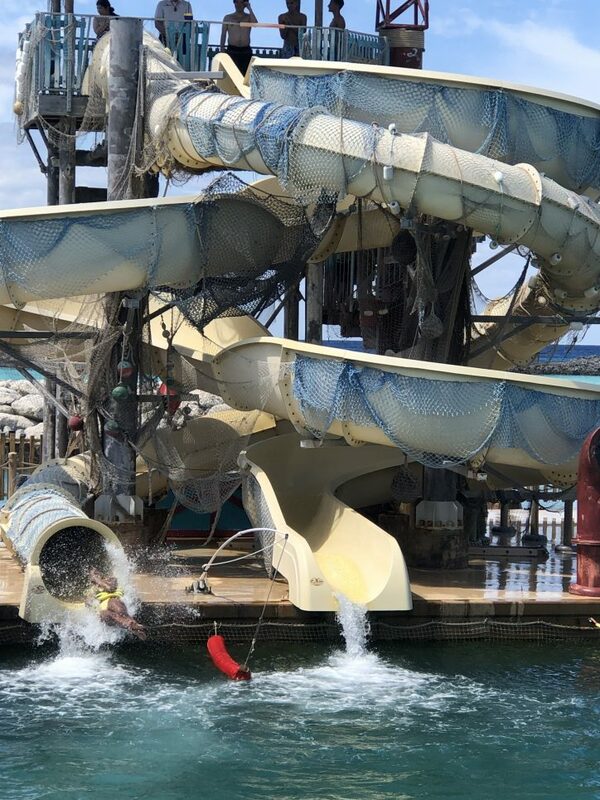 We spent last Spring Break at Atlantis so it was cool to be able to enjoy the slides and spend some time on the beach with the kiddos. They love the slides and the lazy river. I usually just chill at the pool and take pictures. The last time that I went on the lazy river, my tube wanted to do it’s own thing so yeah…I am not going back for awhile. We spent about 6 hours at Atlantis, which is just enough time to enjoy the water, have lunch and explore a little. The waves were very serious so we didn’t spend as much time at the beach. Before we knew it, it was 4 p.m. and time to head back to the ship. I wasn’t playing around after having those dreams that the ship left us lol! It took a while to get everyone cleaned up and ready for dinner. 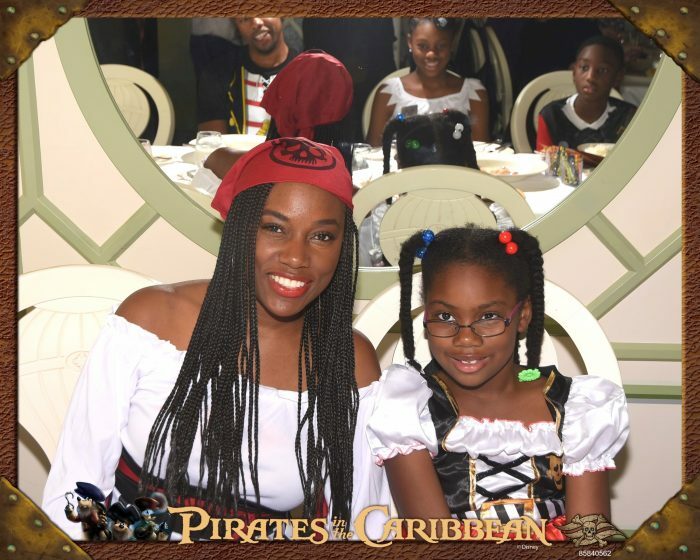 It was Pirate Night!!! I ordered a bunch of Pirate stuff from Amazon. Thank God for Amazon Prime. Tip 5: Order or make Pirate costumes Everyone willingly participated in Pirate Night (even the hubby) and we enjoyed dinner at the Enchanted Garden. This restaurant was the prettiest but I wasn’t crazy about the menu. I think it changes from time to time and perhaps I ordered the wrong selection. The older two kids enjoyed watching Captain Marvel in the movie theater while the little one and I went to see Beauty and the Beast live. I was so impressed with the theater, performers and special effects. We enjoyed fresh popcorn, gummy Mickey’s and ginger ale while watching the show. It is amazing what they can do on these ships. I must say it was a full day and we were all ready to go to bed. The kids were so tired from our daily activities that they only went to kids club once. 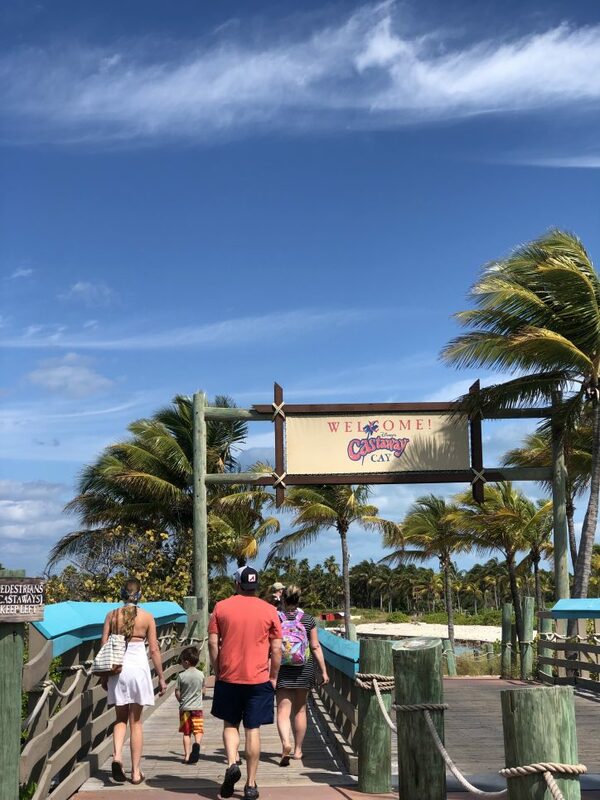 On the third day we headed to Castaway Cay. It was all my little one kept talking about. Disney’s own private island was not a disappointment. You name it, they had it. Slides, kids club, jet skis, snorkeling, great food and an adult only beach. There is definitely something for everyone. My oldest daughter convinced her dad to take her on the jet skis. I thought they were just going to ride back and forth where I could see them but they left with a group of about 12 jet skis and disappeared for like 45 minutes. She said it was the best thing ever!!!! I needed a glass of wine from worrying so much lol. The Disney Dream was really amazing. Now I know what everyone was talking about. It was worth every penny to see my kids have so much fun and experience something new. They were actually sad when we started packing up our bags. There is so much more to share but I don’t want to tell you everything. 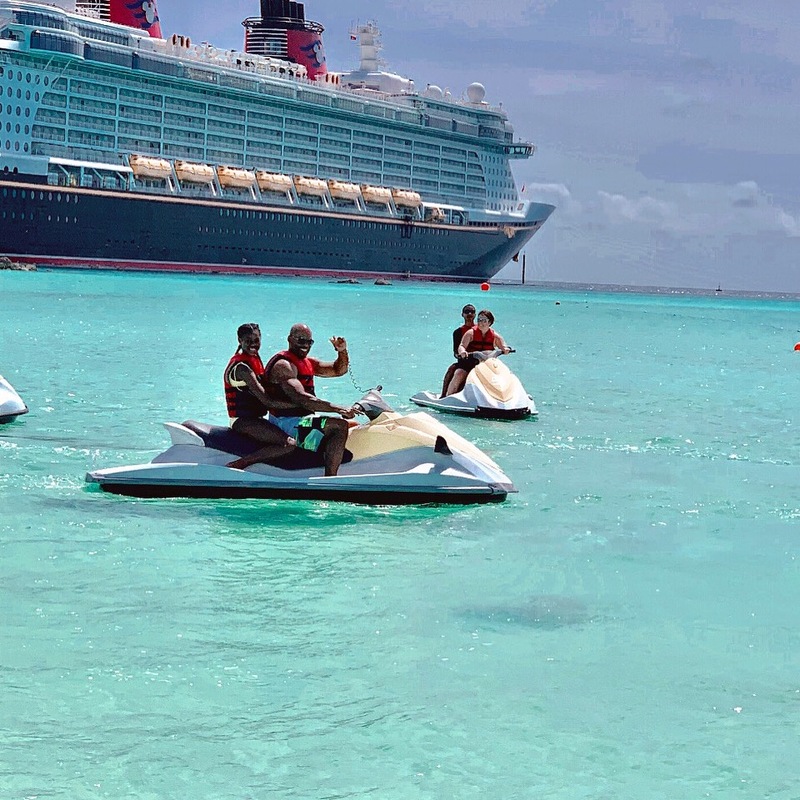 I can say that if you have never been on a Disney Cruise you should definitely plan one soon. Tip 6: Go for it Don’t let fear hold you back from exploring the world. I am already planning our next Disney Cruise for 2020. This time we are heading to the Mediterranean!!!! 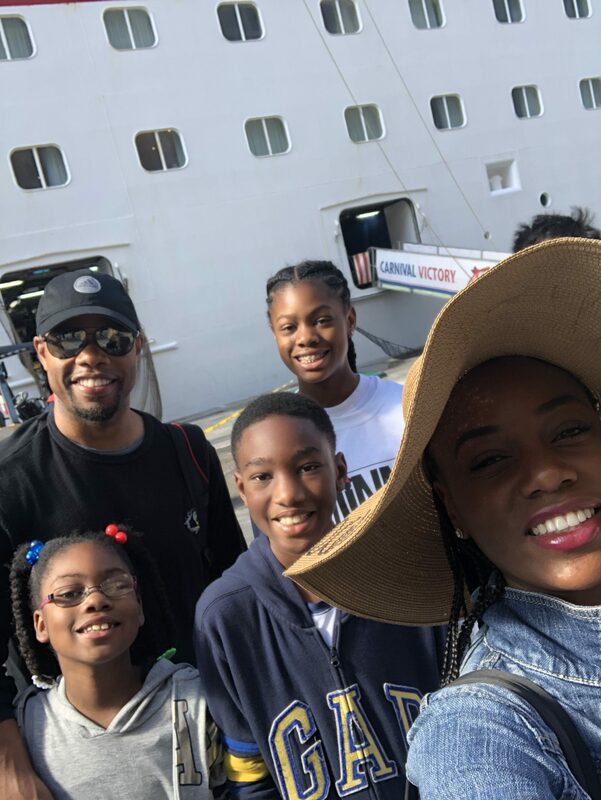 Where’s your favorite family vacation spot?